There was a bit of confusion regarding the previous post (#297), so let me shed some light with a simple calculation. So let's do the calculation. We start in 1980 with 667Gb of reserves in the world. Over the course of 24 years (1980-2004), we pump out 609Gb of that, leaving us with 58Gb. To that we add the amount discovered in the period 1980-2004 (i.e. 339Gb), giving us a total of 397Gb in 2004. Clearly, something has gone seriously haywire because the actual reserves in 2004 are 1189Gb, i.e. 792Gb more than we should have if discovery is the only way to increase reserves. 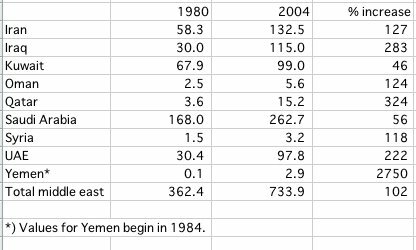 That's a massive discrepancy roughly equal to 4 Saudi Arabias, or 66 Prudhoe Bays. 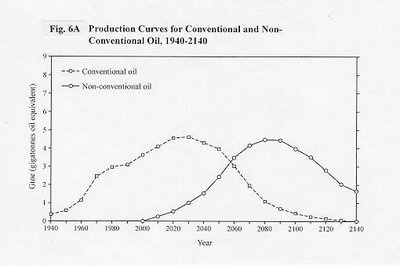 So, all you peak oil geniuses out there, where did it come from? It could not have come from discovery. Spurious additions to OPEC reserves won't explain it. 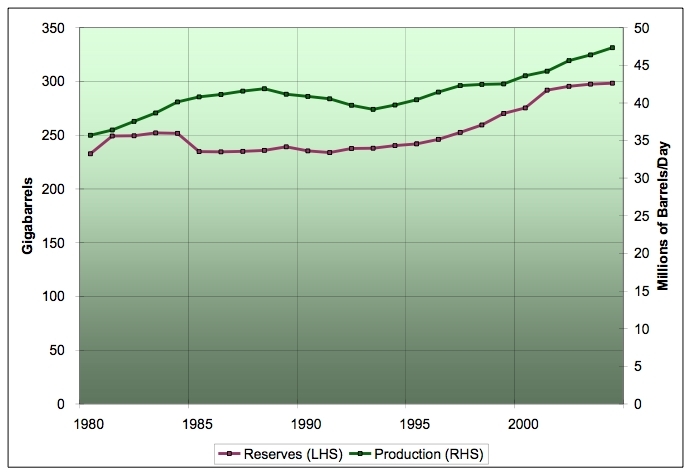 OPEC reserves only increased by 456Gb from 1980 to 2004, so that still leaves us with 336Gb unaccounted for. That's 28 Prudhoe Bays which somehow got added to world reserves between 1980-2004, without being discovered. Where did that 336Gb come from? We saw this same phenomenon at work in 239. GHAWAR NOW EMPTY. We have already pumped more oil out of Ghawar than the 1975 estimate of Ghawar's ultimately recoverable reserves (URR), according to data from Matt Simmons himself. So how do you explain that? Did the reserves in Ghawar somehow grow without any new discovery taking place? It definitely seems that they did. But if the reserves of Ghawar can grow without new discovery, why can't other OPEC oil fields grow in the same way? Why is it so outrageous to think that OPEC reserves can grow given that we are forced by the facts (as given by Matt Simmons) to admit that the reserves in Ghawar have grown? Now, it's true that OPEC updates its reserves figures in an unorthodox way, and the additions seem fishy on the face of it. Nevertheless, it is silly to think that OPEC reserves do not grow, even though non-OPEC reserves world-wide do so. If OPEC reserves do not grow, then the reserves of Ghawar have not grown since 1975. Ghawar is now completely pumped out, as I have previously shown, and we are all already dead from the cataclysmic repercussions of that event. One of the problems I have with the peak oil community is its obsession with a near term peak in conventional petroleum. I don't really see this as the main problem because there are other forms of energy which can and will take up the slack, primarily coal and nuclear. The larger problem, I believe, lies farther in the future, at the point when oil and gas have peaked and become seriously exhausted. So let's take the longer view and assume we're already at that point. Maybe the year is 2050 or 2100 -- pick your own number -- but for all practical purposes, we're very low on oil and gas. What does the world look like? Some say: No problem, we'll just switch over to coal. But that's screwy. If we're going to switch to coal in the post peak oil/gas period, everybody is going to be switching and sucking down the coal of coal-rich nations (like America and Australia), not just the coal-rich nations themselves. Or, alternatively, the coal-rich nations will be powering their grids and driving on coal, while the rest of the world will be struggling to keep the lights on. Scenario 1) A world carpeted with tens of thousands of nuclear power plants. The question here then is security. Clearly the risks of dirty bombs, terrorists acquiring nuclear weapons, accidents due to mismanagement etc. increase greatly in this situation. We could have centralized enrichment and reprocessing/waste management, but then you've got a sprawling logistical network of nuclear/radioactive materials criss-crossing the earth in routine shipments, much like oil does today. Which will clearly increase the risk of theft, terrorist attacks, acts of war etc. A good question to ask here is: When and where will the first dirty bomb be detonated? And whose facility will the radioactive material come from? On the other hand, you could have localized enrichment and reprocessing. That would eliminate the logistical risk, but introduce the risk of proliferation of nuclear weapons. That doesn't seem like such a good idea either. In any case, you're going to need a massive worldwide security/emergency-response apparatus to police the situation, and this is an externality whose cost the nuclear power companies themselves should be forced to bear. Scenario 2) Due to the risks involved in 1), 2nd tier countries are forcibly barred from nuclear development, and thus from electricity. This, however, seems likely to lead to conflict, and surges of refugees into nuclear countries where the power is still reliable. This too will necessitate huge investments in security. In the peak oil community as a whole it is becoming ever clearer that an enormous amount of technological & sociological options are there to provide us with a sustainable world. The discussion of what level of welfare can be achieved with these options is still ongoing. Everyone that has studied the peak oil issue knows that a large change has to happen to make this a sustainable world, no matter what level of welfare we are talking about. What we see in the chart above is the Regular scenario that I made in the Peak Oil Netherlands World Oil Production & Peaking Outlook of 2005 (peak in 2012). This was based on a bottom-up oil projects analysis which has now proven to be slightly on the optimistic side. The actual production at the end of 2005 has been roughly 600.000 barrels per day lower than what I expected. The preliminary conclusion that we can draw from this is that the decline in the world as a whole is somewhat larger, more in the vein of ExxonMobil’s 4% to 6% than Shell’s 2% - 3%. Another option is that geopolitical forces and project slippage are quite big (even the disruptive scenario which tried to account for these factors was a little bit too optimistic). In any case, should we be worried about this outcome for 2005? That depends on your viewpoint. 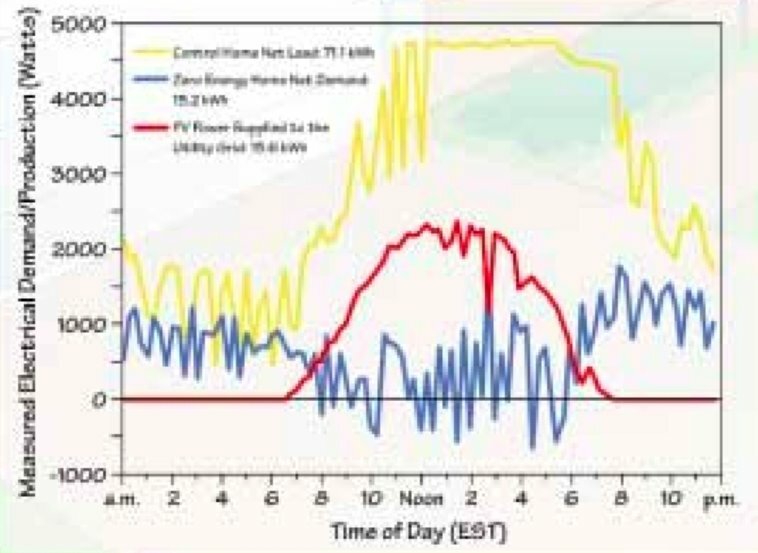 The second scenario in the chart above, demand influenced, is trying to integrate demand side responses. At the moment I am not that sure how this will all play out. I strongly believe that we are in what Goldman Sachs calls the “superspike” period. 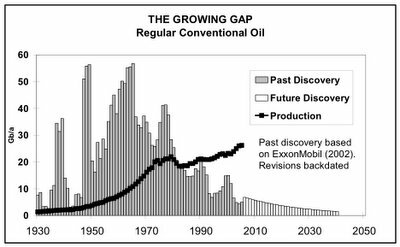 Oil prices will go through the roof (100+ dollars) in the coming years due to supply constraints on the geological side but also the investment and refining side. 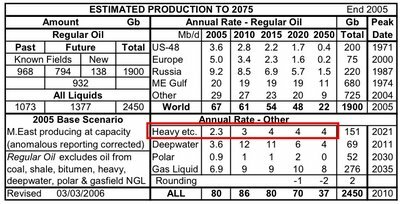 According to the oil project analysis there is enough oil out there to postpone a peak until at least 2010. I realize that this is still under debate, but for the scope of this article I consider a peak before 2010 quite unlikely. In the media the current price rise is attributed mainly to demand and geopolitical factors. While this is true, the underlying cause is simply that many more oil countries have peaked as of late. In the past five years, nine countries have peaked so far. 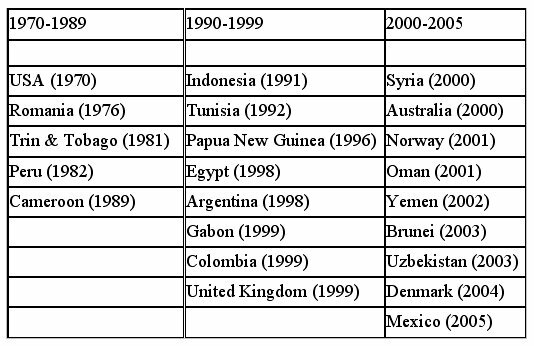 In the 10 years before that only eight countries peaked. It is safe to say that the decline rate in the world as a whole is increasing. 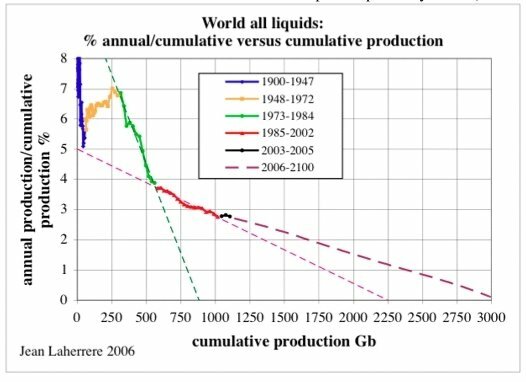 This is what has truly caused a decline in the spare capacity of the world; the increased demand only increased the problem. The chart below shows the years at which either peak or a decline after the plateau period happened for the stated country. If we assume that superspike will happen in the coming years how will it influence demand? In the most optimistic case everything goes very smoothly. At a certain supply level demand lowers itself to fit into the constraints of supply. That will cause the oil price to equilibrium out at the level of supply at that time. The price will cause additional investments to take place that could provide more oil to the market. This is the basic outline for the “regular” scenario. On the other hand, will the world be such a smooth place in the zero-spare capacity game we are in at the moment? All eyes are focused at Iran at the moment. What will happen to oil production given the nuclear debate and possible intervention? I consider it quite likely that another oil shock takes place, or multiple smaller ones, triggering “superspike”. In this case the demand influence comes into play. The production level I have presented in my scenario is only instrumental to demonstrate this point; it could very well be that production drops firmly for a while due to such a shock. If such a shock happens, economies will take a blow like in the 70’s, demand drops to come into equilibrium with the new supply situation. However, there is no fall back cushion from the supply side, only a strategic reserve cushion that could help somewhat. You can imagine that the effects could last for quite some time; oil production is not restored that easily and stays on a plateau level. In the beginning, oil prices of near 200 dollars per barrel are a reality, probably moderating after a few months to a year to around 100 dollars a barrel. This superspike period will be the time when we all the technological & sociological options will be put to the test. If the will to invest and change doesn’t take place in a longer period with very high oil prices, when will it work? 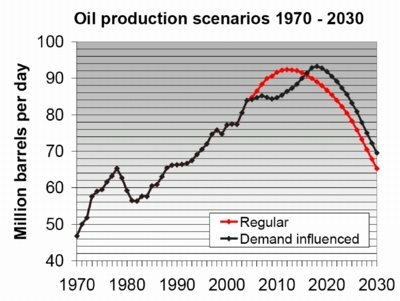 In the most optimistic scenario, oil production just keeps on a plateau until it drops off because demand starts to decrease due to the technological and sociological change. The peak presented in the demand influenced scenario can be scrapped from the chart. And peak oil isn’t all that interesting anymore. In the more realistic scenario, we still keep on demanding gigantic quantities of oil. Since everyone wants to have more of the stuff huge investments take place in oil production capacity to sell at high prices. After a few years, this investment is translated into higher oil production which may moderate oil prices of around 100 dollars a barrel to a lower level, such as 60 dollars a barrel. Than the last spurt takes place to a peak around the end of the next decade, pumping at full tilt until production starts dropping off sharply. The downside curve in the chart may be too optimistic in this case. In any case the continued high prices will be a breaking point to cause change. Over time, we've seen a gradual shift in the rhetoric of the peak oil community. The original pessimist position was based on "hard", unavoidable numbers and realities: the human population is dependent on oil for food, and as oil declines, this must lead inevitably to mass die-off of most of the world's population. As we have seen, however, this argument is only superficially plausible, and when we dig deeper into it, we find that it is basically a bunch of B.S. On the whole, even the doomers themselves have grudgingly accepted the refutation of die off theory, and have shifted their focus to economic cataclysm. Their rhetoric is now based on concepts like fiat money, unmanageable debt, recession, depression, inflation, deflation, stagflation, consumer credit, housing bubbles, financial overextension and imbalances etc. etc. It's kind of ironic really. The original doomer position was that economists are wholesale idiots, "flat earthers" who have no credence whatsoever. They were supposed to stay out of the peak oil debate and leave it to geologists -- because economists don't have the expertise to comment on oil depletion. Yet now, we are seeing the peak oilers crassly invading the turf of their enemies (the economists) in order to salvage their collapse scenario. I guess the bottom line on the turf question is that economists have no valid opinions on peak oil because they have no expertise, but peak oiler amateurs have valid opinions on economics because they're... well... peak oilers. One thing is for sure, though: economic apocalypse is notoriously hard to predict. The coming years will be a bad time to be ill-advised. A time fraught with snares for anyone who is unprepared. We could be on the verge of a financial upheaval when blood will, indeed, "run in the streets". The authors describe in great detail the coming upheaval due to the Latin American debt default, the imminent real estate crash, the end of American supremacy etc. etc. It's entertaining reading because the authors were 100% wrong about everything. 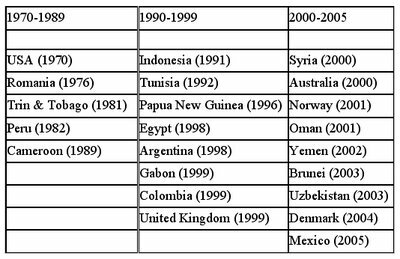 The U.S. didn't go down the toilet in the 1990s. Rather, the country experienced the greatest surge of technology-driven prosperity in its history. My point is that people have been predicting the implosion of the global financial system for more than 30 years. Davidson and Rees-Mogg made an extremely convincing case for it 20 years ago. Nevertheless, nothing actually happened. In fact, anyone who actually bought into their imminent collapse theory in 1988 got burned. The warning sign, I think, is the tone of the analysis. Davidson & Rees-Mogg were so sure of themselves, and it's eerily reminiscent of the tone in the peak oil community. Many of the quotes from their 1988 book could have easily been lifted off The Oil Drum or peakoil.com yesterday. That's the problem. The economic future is highly unpredictable and should be addressed by hedging -- not by being sure of yourself, but by questioning yourself. Seriously and toughly asking yourself: Could I be wrong? And if so how? What am I missing? That's what Davidson & Rees-Mogg didn't do and that's why they were so wrong. In responding to the previous article, diemos trotted out the usual peak oiler argument for recession, and because it is so pervasive, let's give it a closer look. Assume prices double but you still have the same amount of money. You and everyone else are now buying half of what you were buying before. Your standard of living goes down. This assumption is simplistic and has nothing to do with the real world. The current annual inflation rate in the U.S. is about 3.4%, and that's fairly high by recent standards. At that rate, it would take about 20 years for prices to double. In fact, the CPI-U currently stands at 199.8 against a basis number of 100 for 1984 (Source). Which means it has taken 22 years for prices to double. So diemos is essentially asking us to assume that wages and salaries remain constant over the course of decades. That's a bad assumption which we shouldn't grant. Another important point: Even assuming that things work as diemos says they do above, it's not clear why this would be a problem for, say, oil companies. 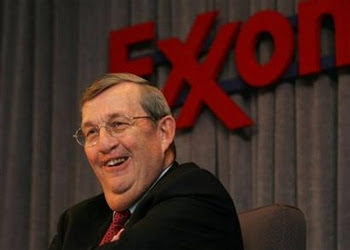 If the price of oil doubles, and you buy half as much, it has no net effect at all on the oil companies. You're still paying them the same amount of money, which means that their revenues are unaffected by your behavior. So let's talk about the real situation instead of a fairy tale. I refer you again to the case of Stacey Harper in #180. And there's another reason. A big one. "I have extra money," she says. Isn't that astounding? She actually enjoys van pooling. So how is this a drop in her standard of living? She's getting the exact same functionality (transport from A to B), paying less, and enjoying it more. Where's the "drop"? You could say the same thing about telecommuting. Gas prices double, so you negotiate a telecommuting contract with your employer to commute half the time. You're getting the same functionality (commuting to work) for half the cost, saving hours and hours of wasted, braindead driving time, and you get to work in the comfort of your own home. You can sleep later. So where's the "drop"? Same goes for moving closer to your job/shopping. You get from point A to B by bike or foot, so the functionality hasn't changed. You're saving time and money. You're healthier because you're getting exercise. Where's the "drop"? The people who made their living providing the stuff that you used to buy but don't any more now have no job and thus no money. They stop buying things and their standard of living REALLY goes down. This is a recession. There is some truth in this. As Stacey Harper and people like her improve their standard of living by shifting away from car dependence, this does put stress on those employed in car related industries. And it does lead to people being laid off. However, this is a temporary situation, which is largely (if not totally) compensated by rising employment in growing sectors -- i.e. the sectors where Stacey spends her new monthly surplus of $160-180. The people who lose their jobs get a new one. The autoworkers laid off by GM get new jobs, like commissioning wind turbines for GE. The key questions are how smoothly this transition can be achieved, and how many new jobs are created relative to those that are lost. EnergySpin has found some thought-provoking information which deserves a place here. This supports the view we've discussed before in 209. THE ULTIMATE PEAK OIL HERESY. 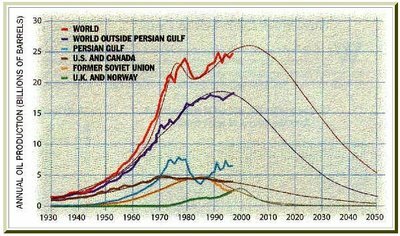 Who's to say that peak oil will lead to collapse and economic recession/depression? It's very possible that peak oil will lead to massive construction, employment growth and economic boom due to the need to rebuild and retrofit everything. After you've followed peak oil for a while, you begin to notice how much of their hysteria just blows over. Somebody on the boards posts a doomy prediction, and they all freak out on it for a while like a bunch of monkeys going nuts over a snake in the cage. Then the prediction doesn't pan out so they quietly forget about it and repeat the cycle. A good example of this is hype about the impending reinstitution of the draft. 1. Michael Moore's film helps stir up anti-Saudi sentiment among the general population. 2. House of Saud continues to destabilize. 3. Increased terrorist activity, relating to number two. 4. Need a president to call for a draft? Who better to ask than a Democrat ex-war hero? Just like you needed a Dem to get welfare reform through, you need a Dem to get the draft. So what happened there, wonderboy? Was there a booger on your crystal ball? If you note, I tend to couch my language (including the above post) in terms like "I think." That implies some degree of speculation as to the details. So when Savinar tells you "Civilization as we know it will end soon," you might want to remember that Savinar is a green 20-something who is just "speculating". In fact, his grasp of reality is so tenuous that he actually thinks WWIII will be triggered by a Michael Moore movie. By the end of the decade, oil sands will be the leading factor in supply growth, surpassing both conventional oil and deepwater. Alberta will be the world leader in adding new oil production in the next decade, surpassing Saudi Arabia, Brazil, Kazakhstan, Azerbaijan, Angola, Nigeria, Mexico, UAE and the USA. Annual additions to oil sand capacity will increase sharply in the next 5 years: 150,000 bpd in 2006/2007, 300,000bpd in 2008, 400,000bpd in 2009, 500,000 in 2010. The report also has a detailed list of new Canadian oil sands projects which are scheduled to come on stream. The province's first nuclear power plant could open in the oilsands within a decade, says a Calgary-based company in talks with several oilpatch players and government officials to bring the project to reality. "It'll come -- it's just a matter of the date," said Wayne Henuset, director of Energy Alberta Corporation. So why is it exactly that oil sands production will hit 4mbd in 2015 and then just stop dead in its tracks? I could see growth halting due to the Kyoto Protocol or some other hard limit imposed by the government, but that doesn't seem likely given the public's current level of political activism, and their profound addiction to the private automobile. There's also an inconsistency between peak oil sources on this topic. ASPO gives a maximum figure of 4mbd for all heavy oil, but (as we saw in 187. 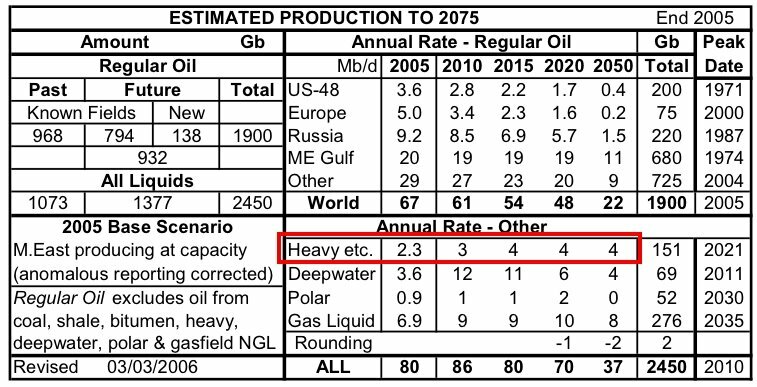 FISHY HIRSCH WEDGES) the Hirsch report assumes that heavy oil production in Venezuela alone can be jacked up from 0.6mbd to 6mbd in 10 years as part of a U.S.-driven "crash program" of mitigation. The EROEI of corn (maize) ethanol is one of the "hot button" issues of peak oil, and a source of endless debate. On one side, you've got the partisans of David Pimental who say corn ethanol has an EROEI less than 1, and thus takes more energy to make than it actually contains. On the other side, you've got folks citing a variety studies showing Pimental to be in error. This debate crops up again and again, and in fact, we had a little outbreak in the comments of this blog the other day. The topic is boring in the extreme, and guaranteed to give you a migraine headache, so let's save ourselves a lot of time and misery by short-circuiting the entire fruitless argument. My thesis: The poor EROEI of corn ethanol doesn't matter if you use a cheap, non-liquid form of energy (like coal) to do the distilling and synthesize the fertilizer etc. If you proceed that way, then ethanol can be regarded as a form of "coal liquefaction", and the low EROEI doesn't matter. The question is whether coal liquefaction via ethanol is more cost effective than coal liquefaction via other routes. 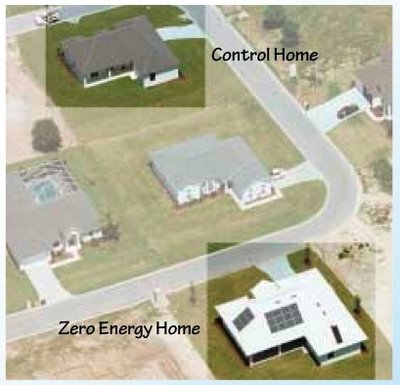 Cleaner options in the same vein include using nuclear or solar process heat. 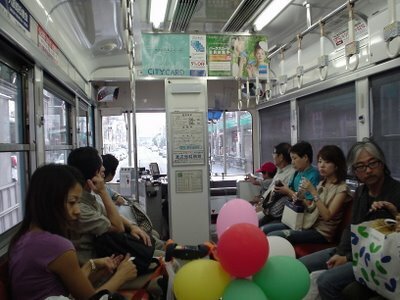 Continuing my series* on what the future looks like, I thought you might get a kick out of this real-life street car which I ride sometimes to a friend's house. 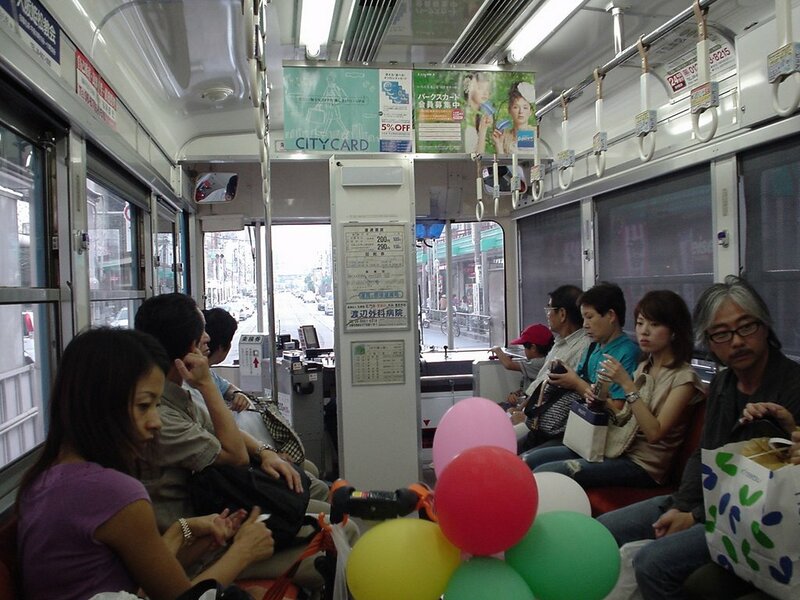 It's a popular ride here in Osaka, where people call it the "Chin-Chin Densha". 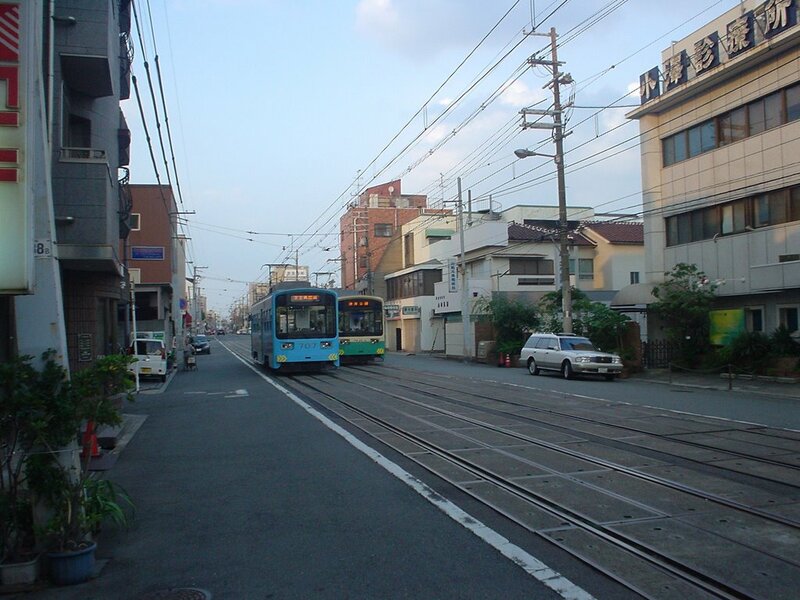 Here the Chin-Chin Densha pulls into the station to get a new load of passengers. 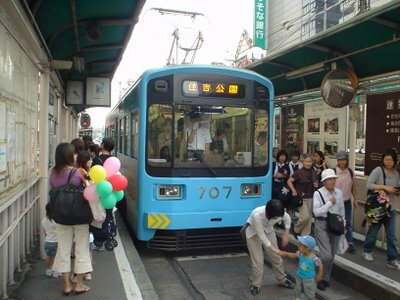 Note the pantograph on top. These cars have been around for decades, but they're actually trendy EVs (Electric Vehicles). 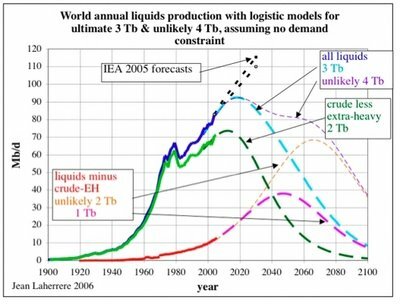 Looking at Laherrere's liquids forecast in the previous entry (#282), I couldn't help but notice the striking similarity to some old charts from the uber-cornucopian economist Peter Odell. According to the caption in the article, the red line indicates conventional + unconventional oil. 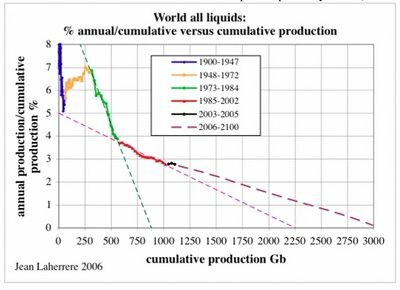 Note that the graph tops out prior to 2005 at a global production level of about 26Gb/year = 71mbd. This was substantially in error because the world is currently producing about 85mbd. What a difference 8 years makes, eh? In the new chart, conventional + unconventional tops out around the year 2020 at 92mbd. Interestingly, Laherrere not only includes the likely case (unconventional = 1Tb) but also an "unlikely" case (unconventional = 2Tb). This is clearly a hedge. If 2Tb was truly unlikely, why even put it in the chart? It's almost as though he's toying with possibility of an unexpectedly large flow of unconventional oil. Isn't that resemblance striking? Laherrere starts out in 1998 with no secondary unconventional hump. In 2006, he commits to a little mini-hump (the purple dashed line indicating 1Tb of unconventional). But, at the same time, he hedges his bets with an "unlikely" full-size secondary hump (the orange dotted line indicating 2Tb of unconventional). And this "unlikely" hump sits side-by-side with the conventional hump, just like in Odell's 2000 paper! Laherrere seems to be slowly inching his way into the chilly waters of cornucopianism. *) This paper "The Global Energy Market in the Long Term: The Continuing Dominance of Affordable Non-Renewable Resources" has been removed by the site which formerly hosted it, and can only be found now in the Google cache. If you're interested, you should download it before it disappears. 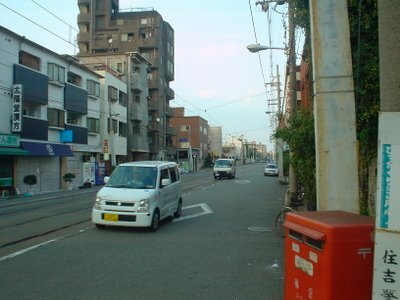 It is located here. To his great credit as a scientist, Jean Laherrere has accepted the common-sense criticism that liquids are what matters, not the irrelevant cult-object subset of liquids which Colin Campbell calls "Regular Conventional Oil" (see #43, #52 and #230) . Laherrere now accepts that biomass liquids and synthetic oil from coal are a form of "oil" and must be counted as such if we are to face reality. 5% down in 2030... Yup, that should give you plenty of time to get that rustic doomer hide-out you foolishly purchased up and running. Have fun cleaning out the barn for the next 25 years!! If you get tired, and want to know who to pin the blame on, click here. In #274, I briefly discussed flow batteries, and provided a link to Jim Fraser's explanation of how they operate. These batteries are capable of storing huge amounts of energy -- on the order of hundreds of MWh (enough energy to power 100,000 ordinary homes for a few hours). While flow batteries are not new, the first dating back to the 19th century, interest has grown since the 1970s, and especially recently as they have become commercially viable for large-scale applications. They currently sell for approximately $500 per kWh of storage capacity, with incremental storage costs in large-scale systems of only $150 per kWh. In comparison, the cost of the 550 MW Portlands Energy Centre [a gas peaking plant] is projected to be $700 million. Installation costs are difficult to compare, as generator size is measured in megawatts (MW) while batteries are measured in megawatt-hours (MWh). The installation cost of a generator, to be compared to a battery, would have to take into account the number of hours it is expected to operate. If the Portlands Energy Centre served a daily peak of five hours duration, installation would cost $255 for each daily kWh it produced. Installation of a five-hour flow battery would cost $220 per kWh. Working lifetimes of the systems are comparable. Operating and maintenance costs of flow batteries are dramatically lower than those of gas-fired generation, at a tenth of a penny per kWh. The system operates automatically. The "fuel" for flow batteries is inexpensive energy purchased off-peak at about 3 cents per kWh. With energy losses of 25 to 30 per cent, total costs for delivery are about 4 cents per kWh. Gas-fired generation, by contrast, fluctuates around 7 cents per kWh just for the fuel to produce it, with much higher operating and maintenance costs that can bring the total cost to 10 cents per kWh produced. 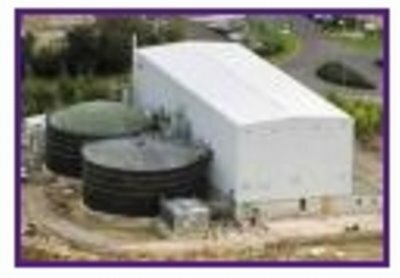 Flow batteries also have other advantages relative to gas peaking plants: short construction periods, zero emissions, low noise, few moving parts and smaller site footprint. These batteries are a great idea, and in fact, may actually be too great of an idea. If they catch on, they're bound to step on the toes of the existing Big Gas industry and all the fat cats and speculators who've invested in gas futures and LNG. Now that every greedy scumbag around is positioned to profiteer on skyrocketing gas prices, the last thing they want to see is some slick, simple technology which slashes demand for gas. Developed as the Regenesys Project with the Tennessee Valley Authority and partly funded by the U.S. Department of Energy, the project generated tremendous interest through 2003. 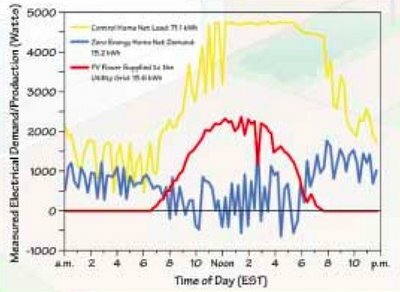 A 120 MWh peak system was to provide the power for 7,500 homes for 10 hours each day. COLUMBUS, Miss. - Seven months after halting construction of a cutting edge, large-scale power storage plant here, Regenesys Technology Ltd. has pulled the plug on the $25 million Lowndes County project. The company will no longer manufacture the technology needed to run the 12-megawatt plant that was being built off Mississippi 373 near Columbus Air Force Base. Mark Kuntz, Regenesys' vice president of marketing and business development for U.S. operations, said German utility company RWE purchased its parent company, Innogy Technology Ventures Limited of Great Britain, and wishes to stop funding the technology. Innogy, the energy group, has abandoned its Regenesys electricity storage project after its German parent, RWE, decided against investing the money needed to commercialise the technology. In the interests of honesty and full-disclosure, it's probably best if we take a close look at the numerous failed peak predictions of Professor Kenneth Deffeyes, PhD. And he [Deffeyes] believes the highest single year may already have passed. 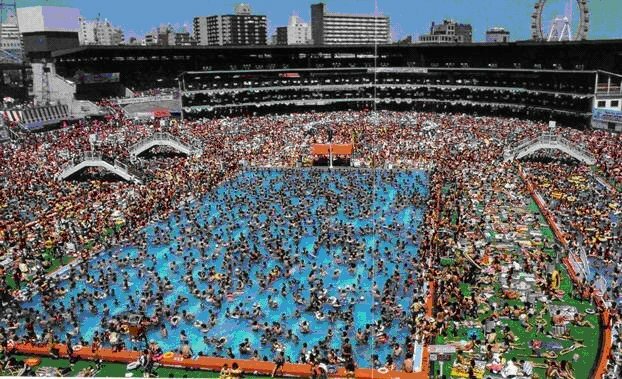 "2000 may stand as a blip above the curve and be in the Guinness Book of World Records." 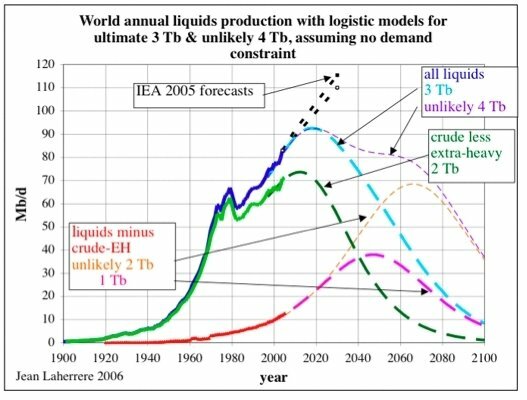 This may substantiate the view, voiced by Ken Deffeyes, at the Paris ASPO Meeting [May 2003], that peak oil production may turn out to have been in 2000 as much from falling demand as supply constraints. This was a huge goof, and seriously calls into question Deffeyes grasp of the situation. According to the EIA, oil production in 2000 was 77mbd, while today it is pushing 85mbd. The numbers pointed to 2003 as the year of peak production, but because estimates of global reserves are inexact, Deffeyes settled on a range from 2004 to 2008. Three things could upset Deffeyes's prediction. One would be the discovery of huge new oil deposits. A second would be the development of drilling technology that could squeeze more oil from known reserves. And a third would be a steep rise in oil prices, which would make it profitable to recover even the most stubbornly buried oil. 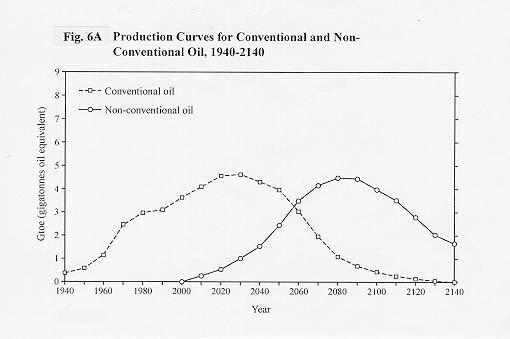 I am 99 per cent confident that 2004 will be the top of the mathematically smoothed curve of oil production. This too, turned out wrong. Production kept rising, so Deffeyes swept the old predictions under the carpet, and boldly stated that the peak would occur on Thanksgiving Day (Nov. 24) 2005. Yet again, his prediction turned out wrong, so he changed his prediction to Dec. 16, 2005. This still isn't the end of it. Just a few days ago a reader of this blog attended the EGU meeting in Vienna. In a "Great Debate" with Jean Laherrere, Michael Lynch and Yves Mathieu, Deffeyes said that if we consider the uncertainty of his regression line, peak oil can be expected to occur somewhere between Nov. 2005 and April 2006 -- i.e. right now. In other words, he's waffling yet again. And now Nov. 2005-April 2006. No integrity whatsoever. Just a sad old man trying to hang onto the spotlight. Maybe it's time to retire, Ken, and open a waffle shop. You wanna know the method that Ken is using to predict the peak now? It's fun. Anybody can do it, and it's guaranteed to work -- even if you're a drooling moron with Cheetos in your nostrils. Buzz over to the EIA site, and see what the current world oil production figure (X) is. State that X is the peak. If in fact X does turn out to be the peak, you're Prophet El Supremo. If oil production subsequently rises, you'll have to "readjust your prediction to take account of new data". Go to step 1. Deffeyes isn't the only scammer out there playing this game. T. Boone Pickens is running the same con, and making money at it! One of the central beliefs of peak oil is that flat or declining consumption of fossil fuels will cause economic growth to halt and decline. 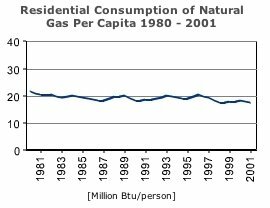 Oddly enough, DOE statistics show that -- at least in the case of personal gasoline and natural gas consumption -- this was not true in the U.S. for the 20 year period from 1981 to 2001. And the DOW rose from 947 in Jan. 1981 to 10788 in Dec. 2000 -- an increase of about 11.4 times (1040%). With no increase in per capita consumption of oil for transportation, or residential natural gas. As you can see, the point holds true. Real GDP per capita grew by 50% from 1981 to 2001. 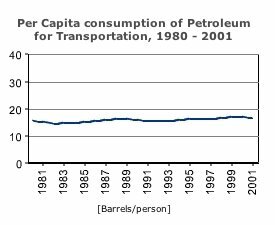 More broadly, this shows that increasing real GDP (both gross and per capita) and increasing stock prices are perfectly compatible with zero growth in personal driving, and decreasing use of natural gas in the home. A large part of the peak oil crowd is stuck inside a narrow minded way of thinking. They focus on oil and politics. Not looking at initiatives that are now small, but financially attractive. One of these is an idea that emerged in the minds of a man called Albert Veerman from Holland, only 2.5 years ago. To build a house from expanded polystyrene (EPS) foam, a widely used packaging and insulation material. The idea was formed when he was demolishing his house and discovered that EPS is far stronger than stones. Since that time he has worked together with the Technical University of Delft to build a house from this material, compliant with European building standards. He started a building company (Veerhuis Bouwsystemen BV). In 2005 the first house has arisen in a small town called Volendam. It has a metal framework (can also be wood or concrete) to carry the construction. This framework is totally encapsulated with a 30 cm thick wall of EPS. Unto this wall a special layer of “veerman mortar” is placed to make the building weather and fire resistant. The floor also is built with special insulation materials. The foundation of the house is made with a material called stelconplaten in Dutch. Due to the super efficient design, this house saves 50% to 60% of the energy in comparison to conventional brick houses. The Dutch use an energy performance coefficient (EPC) which is a measure for the efficiency of a building. The average house in the Netherlands should have a coefficient of 0,8 since 1 January 2006. The EPS house has a coefficient of 0,3! The heating of the house comes from a unit that is so small that it can fit in a small backpack. The prototype in Volendam was even built so that the heating unit can be removed! The building costs are far cheaper due to the simple design; the EPS house costs 30% to 45% to build than conventional houses. One of the causes is the simple method in which EPS can be adapted to any form you want, just by using heat instead of drilling in bricks. This easiness makes the time to construct a house very short. The house in Volendam was built within six weeks. The design can be mass manufactured, pre-fabricated style. If mass manufactured the building time would only take two weeks. The building is compliant with all European building standards. Although the lightness of the material would suggest a storm hazard this is not the case. The house weighs 18 to 30 tons; it is totally weatherproof and can withstand a storm at wind strength ten. The Dutch institute TNO has extensively tested the building; it has a fire resistance of more than 90 minutes. Although some may think that the house will not be very strong, this is not the case. You can easily put very heavy things on your wall, no problem at all. This lightness is one of its strengths. It can be moved to another location very easily. A floating design to combat rising seas is on the drawing board. The sustainability is amazing. EPS is a plastic that only degrades due to UV-radiation. Thanks to the plaster and mortar on the outside this does not happen. In principal this house can last eternally. And even if destroyed around 80% of the materials can be recycled. This invention has already been patented in the European Union. The next step will be to build 180 houses in Bruinisse and Krommenie, two other Dutch villages. The Spanish and Turks are already interested in building such houses. Especially in Turkey since the EPS house can be built to be earthquake resistant. Not long from now, the world will probably be filled with these houses. Think about the possibilities. You can even take your house with you when you take a job in another town.